Placentia, California, November 20, 2012: Vanderveer Industrial Plastics is currently in the process of constructing a temperature controlled machining cell! 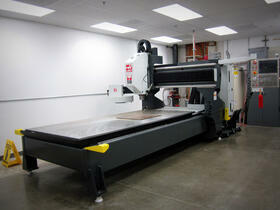 This includes a newer and much larger machine, with a 5’ x 10’ bed. This will allow us to not only machine even larger parts, but also obtain and maintain closer tolerances. Next to this new piece of equipment we are adding a 40” x 20” milling machine. It is widely known that thermoplastic parts are temperature sensitive. All materials expand with changes in temperature however; thermoplastics expand considerably more than metals (e.g. Carbon Steel 10.8x10-6 compared to UHMWPE 200x10-6 i.e. approximately 18 times more). Linear thermal expansion means the product will expand in all directions and this needs to be allowed for in design calculations. The calculation is: (given factor) x 10-6 x length x change in temperature °C. With this new addition, Vanderveer Industrial Plastics will have the ability to machine and inspect using our CMM’s at the same temperature, in adjacent rooms. As an added benefit, this new room is also large enough that we can stage materials within it as they stabilize into the right temperature. Even with small temperature changes, the linear nature of thermal expansion leads to expansion relationships for length, area, and volume in terms of the linear expansion coefficient. Consider a donut, a flat, two-dimensional donut, just to make things simpler. The donut has a hole, with radius r, and an outer radius R. It has a width w which is simply w = R - r.
This is exactly what we got by applying the linear thermal expansion equation to the width of the donut above. So, with something like a donut, an increase in temperature causes the width to increase, the outer radius to increase, and the inner radius to increase, with all dimensions obeying linear thermal expansion. The hole expands just as if it's made as the same material as the hole. Vanderveer Industrial Plastics strives for continual improvement. With the advances currently underway in our warehouse, and the implementation of a temperature controlled machining cell, we look forward to being able to provide even greater quality products to you, our customer.